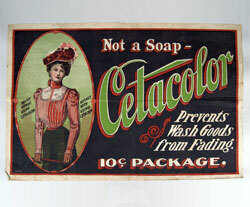 Superb graphics, vibrant color, and excellent condition make this early 20th century American printed linen banner very appealing to the eye. 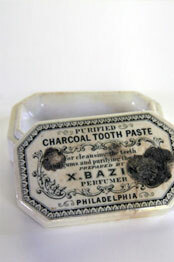 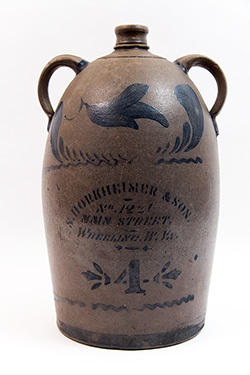 This porcelain black transferware charcoal toothpaste container, marked X. Bazin Perfumer, Philadelphia is an unusual example of early American advertising. 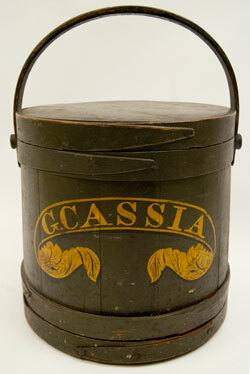 Imagine brushing your teeth with this fine product! 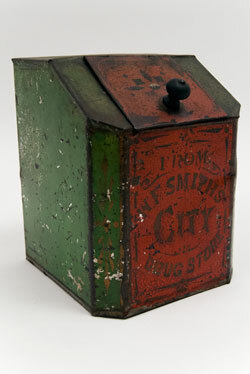 Circa 1880s: Springfield Ohio— Antique country store merchant tins are usually large and cumbersome, but this petite red, green, and gold W. F. Smith City Drug Store stenciled tin with its unusual wooden teardrop pull and beautiful original surface is a truly charming example of late 19th to early 20th century American advertising. 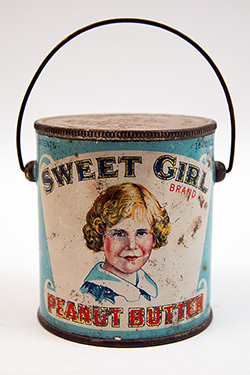 This lovely countertop tin has a great primitive look and will be a super addition to any collection of early advertising, country store, or primitive antique Americana. 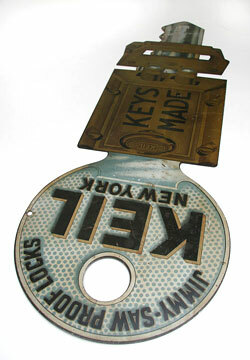 Paper label, packaged for Radio Station KWKH, Diamond Coffee Mills, Shreveport, Louisiana. 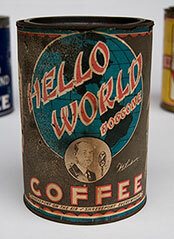 Great early radio advertising! 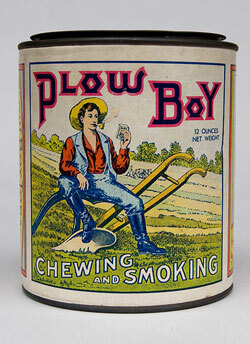 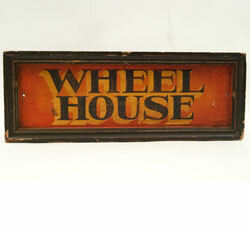 Excellent condition on this early Plow Boy Tobacco Can from St. Louis, MO. 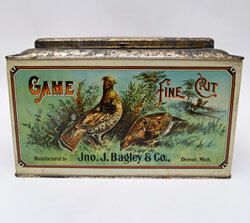 Circa 1910, John J. Bagley and Company Tobacco, Detroit, Michigan: Here is a stunning example of the high quality of early 20th century American tin lithography. 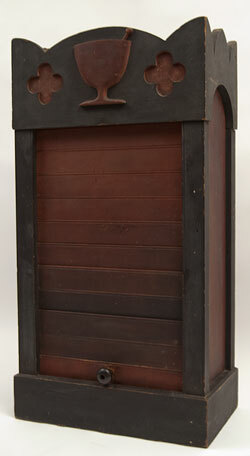 Measuring 11 1/2" wide, 7" tall, and 8" deep, this gorgeous antique general store tobacco bin features a six color tin lithograph of a pair of grouse feeding on the American prairie, thus celebrating the natural beauty of the great plains. 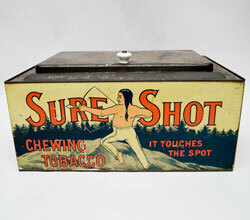 Circa 1910: At 15" wide, 8" tall, and 10 1/2" deep, this formidably sized and highly desirable Sure Shot Tobacco Bin is one of the iconic pieces of antique American advertising. 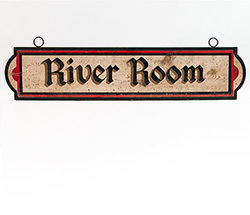 The image of the Indian brave with his bow drawn hearkens back to the nostalgia for and romance of the wild west and celebrates the tremendous natural beauty and seemingly endless expanse of the western wilderness. 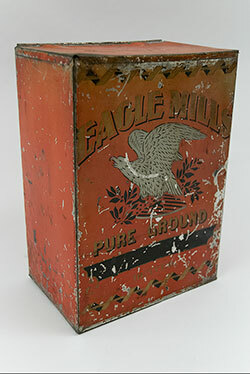 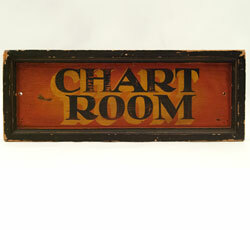 Condition on this excellent general store tobacco bin is superb, making this a very fine example of early 20th century tin lithography with graphics that are hard to beat!